We offer two yearly custom butchers – In early spring we have our hugely popular Big Spring Beef Round Up when we harvest 30 plus grass-fed/grass-finished steers for our customers throughout New Mexico, most of whom are longtime loyal customers of JX Ranch. With the spring butcher we offer free delivery to Roswell, Alamogordo, Edgewood, Santa Fe and Las Vegas, New Mexico. We take orders until sold out, so be sure to get your order in early! Please call or email Mimi if you have any questions or need some help with the order. In the fall we offer a much smaller butcher (usually 5 – 7 steers only). This butcher does not include delivery – you’ll pick up your meat at Fort Sumner Processing in Fort Sumner. 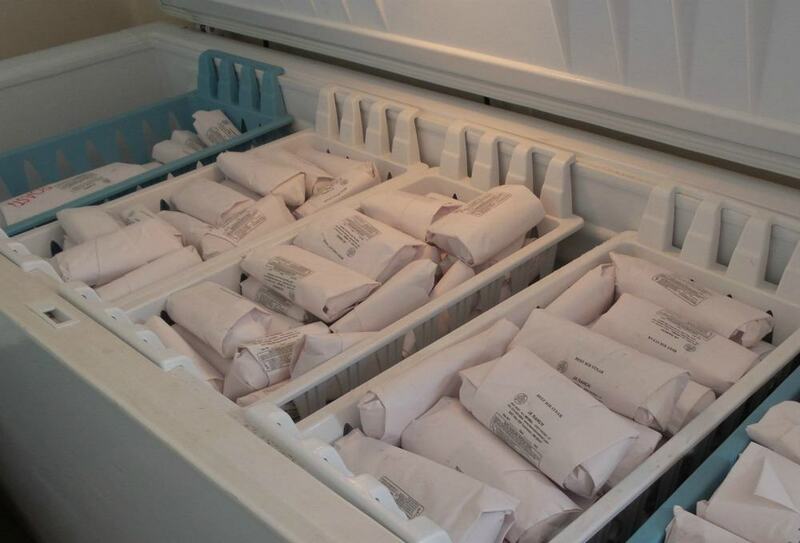 The order process is simple; pick one of the two order forms JX Ranch Package Order Form (whole, half or quarter beef) or Select Order Form (half and whole beef orders only), submit and pay the deposit – and you’re done! When the meat is ready (dry-aged a full 21 days, cut and wrapped into individual packages with your name and the content of the package printed, frozen, boxed up and weighed) I will send you an invoice through PayPal with the balance on your order. You only pay for the pounds of meat you actually receive, no confusing pricing based on “live weight”, carcass or hanging weight”! We pay the butcher, not you. This is a simple, straight forward cut sheet for whole, half, and quarter beef orders with just a few choices to make. This form is for whole and half beef orders ONLY and allows for a wider selection of custom cuts. Once again, the meat is amazing. We did try some places here locally to avoid having a 16 hour round trip and while they were good, its just not the same as your beef. My wife even notices the difference and she really isn’t a beef eater. Tonight she asked for a steak (last time she asked for a steak was the first time we bought from you). My wife said we should order a whole for the Spring butcher now and just buy a larger freezer. I am so very happy with my beef. The flavor and quality is fantastic. I just wanted to send a quick e-mail to you to thank you. Your beef is always the best quality and it is always a pleasure to do business with you. Thank you, Mimi, for the delivery in Alamogordo. What a help this is. We are looking forward to enjoying your great beef again. Thank you again for the meat, the spatula, and the delivery. Your beef is by far the best we have ever eaten. We bought it to see if our sons could eat it (they have stomach issues with regular beef). They loved it and there was no stomach upset. My husband wasn’t in agreement with me buying it in the first place, but after he cooked up and ate the first set of burgers he was a believer. Thank you so much for caring for your animals and your customers. I wanted to let you know that we are SO very pleased with the beef. We’ve tried a few different items so far and the taste is wonderful! I usually hate the smell of cooking beef, but not yours! I am definitely going to order again this fall. We love the beef and the way its cut. Perfect. The beef is, as always, great! We are enjoying the various cuts of meat and learning new recipes is keeping us busy…the meat is too good to waste on bad recipes. 🙂 We appreciate your efforts, and will definitely be buying another quarter next year. We are enjoying our beef very much! The quality is exceptional as usual! Every cut of beef from this cow has been very very tender. The beef almost tastes like the cow ate butter every day. LOL!!!! Very tasty. We are very pleased. Thank you very much for what you do and keep the beef coming. Everything is perfect!! Thanks for making it so easy. When your meat is ready – for the Spring Butcher around end March till mid-April, and fall butcher end October early November – we will let you know how many pounds of meat you’ll receive, an send you an invoice for the balance. In the spring, as a courtesy and to save you the drive to Fort Sumner Processing to pick up your meat, we offer free delivery* to meeting locations in Roswell, Edgewood, Santa Fe, Las Vegas, and Alamogordo. On the order form, you have the option of a voluntary contribution of $10 towards delivery – always appreciated, never required. For the Spring Butcher with delivery, If you cannot meet us at the appointed time and date, you will need to pick up your meat from Fort Sumner Processing as soon as possible. Fall butcher customers pick up the meat at Fort Sumner Processing. Many of our customers get together with friends or family to split a whole or half beef for cost savings. If you split an order with someone you both still pay the lower price per pound but can still submit your own cut sheet. With us you pay only for the total pound of meat you actually receive. No confusing “carcass” or “hanging” weight costs, and we pay the butcher, you don’t. Current prices, all inclusive, are $8.50/lb for a quarter beef order, $8.25/lb for a side (half beef) order and $8/lb for a whole beef order. The amount of meat you can expect to receive would be in the range of 85 – 110 lb on a quarter, 170 – 220 lb on a half beef and 340 – 400 lb on a whole beef. For the larger Spring Butcher, we are usually sold out by November, and for the smaller fall butcher usually by late summer. We recommend you get your order in early. Let us know if you have any questions or want some help with either form. We will post on the order forms when we are sold out. * For our free spring delivery to Roswell, Edgewood, Santa Fe, Alamogordo and Las Vegas, NM – Please understand that we are offering this service as a courtesy and are not responsible for your meat – should anything happen en-route such as break-down, delay or accident, we will attempt to contact you by calling the cell number you have given us so you can come pick up your meat. So far we have never had a problem, but have to be realistic; things can happen. Butcher’s processing costs (butcher, dry-age 21 days in a temperature controlled cool-room for ultimate tenderness and flavor, custom cut and wrap and label packages as per your instructions on your order form. For the spring butcher, for us drive to Fort Sumner Processing and load your meat, then on to your meeting location – Edgewood, Santa Fe, Roswell, Alamogordo, Las Vegas. Local customers from around Clovis / Portales / Tucumcari pick up their meat at Fort Sumner Processing.